VILLAS AND APARTMENTS TO RENT IN ST KITTS, THE CARIBBEAN. 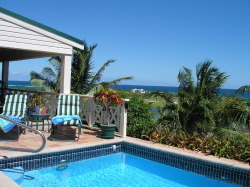 Welcome to our selection of holiday homes to rent in St. Kitts, the Caribbean. Many of the beaches on St Kitts are made of black volcanic sand, but there are several white sand or shingle beaches, some man-made, around the shore, if you prefer your beaches to have that idyllic Caribbean look. Two of the best are Frigate Bay and Turtle Beach, located at almost opposite ends of the island and very different in character. Frigate Bay is only a short taxi ride away from Basseterre, or you can jump on one of the colourful local buses. The beach is pleasant enough, but it is at night when this area comes to life, as there are several beach bars and restaurants, with live music at weekends when the party goes on until the sun comes up. Turtle Beach is located at the end of a peninsula at the south of the island, a long drive from Basseterre or the main resort. A popular spot for water sports, like sailing and deep sea fishing, the beach is also home to a great restaurant called The Monkey House; named after the velvet monkeys that may well appear and try and join you for dinner! The town of Basseterre is home to some interesting historical buildings, which have changed little since colonial times. The Circus is the centre of the town, where you can find an excellent selection of very local bars and restaurants, which always make tourists feel welcome. A short taxi ride away from Basseterre is the impressive Brimstone Hill Fortress, while the St Kitts Scenic Railway is undoubtedly the best, and cheapest, way to explore parts of the island that even roads don't go to. Looking for self catering holiday accommodation in St. Kitts? Then below is a selection of apartments in St. Kitts and villas in St. Kitts that can be rented direct from their owners. You can either click on each listing for further details or you can use our search engine on the left if you are looking for something in particular.